The far eastern top of France in an area that borders Belgium, Luxembourg, Germany, and Switzerland is known as Alsace-Lorraine. Now there is a whole history of how at one time the Alsace region was German, then there was a war, and later France claimed it after another war, with a whole bunch of cultural identity challenges tried up in between. But there are a lot of amazing, culturally intertwined, aspects of the Alsace area and a good chunk of that has to deal with food. Delicious food traditions that are uniquely Alsatian such as Bacheofe (meaning: “Baker’s Oven”). Pork, lamb, and beef, marinated overnight in white wine, then placed in a tureen with classic French aromatics, potatoes, and bacon/trotters. When the lid of the taurine is placed on top, the edge of that lid is sealed with a simple pastry crust. It is slow cooked in a slow oven (traditionally in a baker’s oven after the loaves of bread have been baked) until the meats are tender and the stew is brimming with flavor; More on Bacheofe in the future. 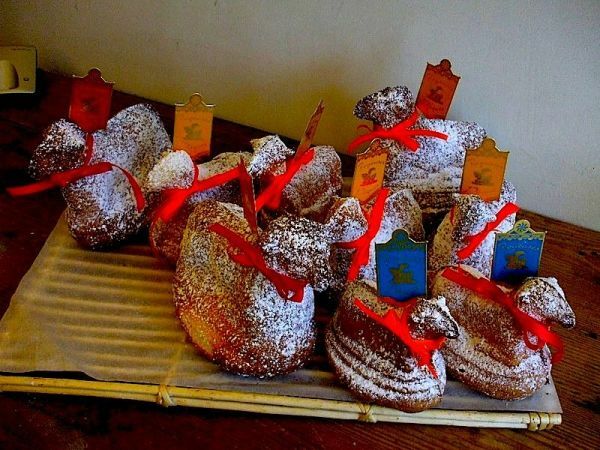 But around Easter, a purely Alsatian treat known as the Oschterlammele (Little Easter Lamb) or simply Lamma-la starts making an appearance in bakeries of the region. Traditionally a simple sponge cake flavored with cherry kirsch, baked in an earthenware lamb mold, is served in family homes on Easter Day. The Lamma-la can actually be traced back to the middle ages from a Catholic theologian in the early sixteenth center knows as Thomas Murner. In his correspondence, he was said to have written that the cake was used as a gift from courting beaus to their prospective brides. So I wanted to do my own version of the “Little Easter Lamb,” not necessarily pen it as an Oschterlammele, but to have been inspired from the Oschterlammele. 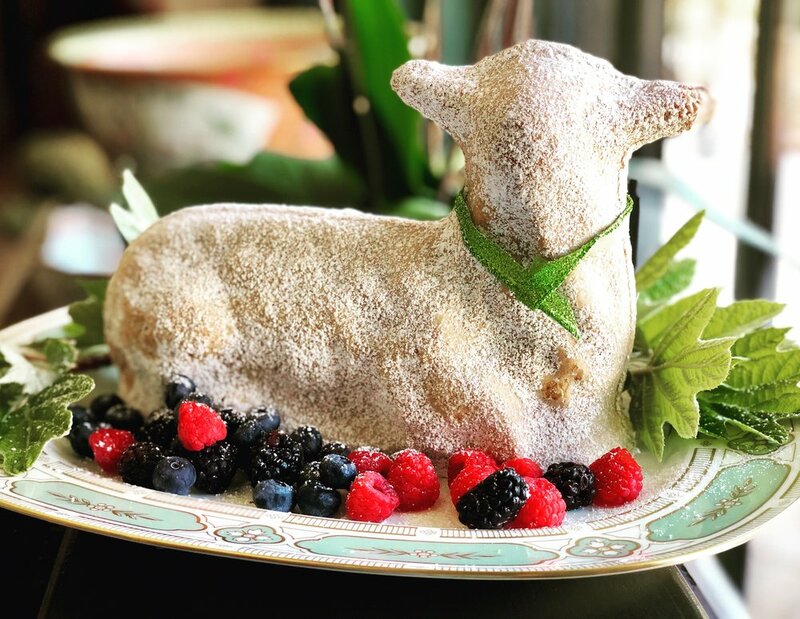 What I came up with was basically a Lemon and Luxardo pound cake, baked in a lamb mold, and dusted with plenty of icing sugar… and it turned out fantastic! Serve with fresh berries, or a berry compote /purée (I would stay away from red berry purées… (think lamb and blood), candied chocolate eggs, and lots of freshly whipped cream. So let’s get to it, and start searching Amazon or your favorite baking supply shop for that perfect lamb Cale mold. Placing toothpicks, dow rods, or bamboo skewers in the head and neck region helps to stabilize the area. 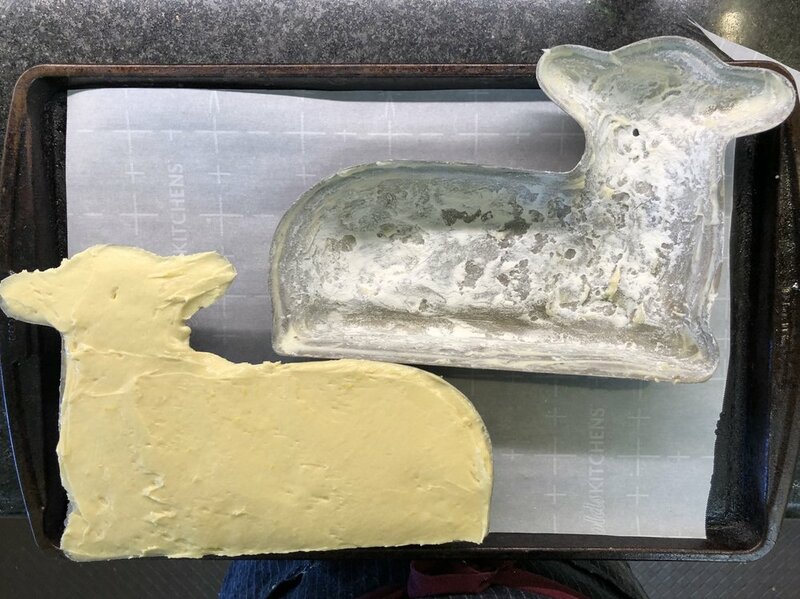 Prepare the inside of your two-piece lamb mold by generously buttering and flouring the inside of both halves. Knock out any excess flour. To stabilize the neck and ears region, I add bamboo kabobs skewers to the top mold (the front facing side) horizontally from ear to ear, and then vertically from the head down through the neck. The cake should be stable enough… but nothing like a decapitated lamb at Easter to really get grandma worked up. Preheat your oven to 350 degrees convection bake. In the mixing bowl add the butter and sugar and cream well with your mixer. Add the eggs one at a time and mix until light and fluffy. Scarped dawn the sides and bottom of the bowl. In a separate bowl add your flour, salt, and baking soda. Mix with a spoon to combine evenly. To the butter and eggs mixture add the Luxardo liqueur and the lemon zest. Mix to combine. Next, and in batches, add the flour and heavy cream. Mix just to blend into a batter after each addition. Scrape down the bowl and continue until the last of the dry ingredients and the cream have been added. Spoon the batter into your top mold starting with the head and working your way down and through the body of the lamb mold. You will want to fill and smooth out evenly the top mold all the way up. The idea is for the bottom mold to fit on top and the cake to bake into the bottom mold making one solid cake. Be sure the cake batter is smoothed out evenly. Secure the bottom mold on top, and place the cake on a parchment paper lined baking sheet pan to catch any spillage and drips. Place the cake into your oven and bake for 1 hour. Test by carefully removing the top half and inserting a toothpick into the center of the cake. Once your cake has cooked remove from the oven and allow to cool for approximately 15 minutes or cool enough to handle the mold tins. Carefully remove the whole cake from the mold. Trim off any excess seams, and set the cake upright to cool further. While the cake is cooling I like to brush on powdered sugar to give the lamb a “stone” effect. In a small dish add a bit of powdered sugar. Using a pastry brush, brush on the powdered sugar all over the lamb. This will kind of melt into the warm cake. Tie a red ribbon, or a color you like, around the neck of the lamb. Serve with fresh berries, fruit purees, chocolate eggs, and whipped cream. Enjoy! The cake batter is filled and smoothed out to the very top of the front facing half of the cake mold.